Marengo is a history student from Amsterdam with a special interest in Portuguese, Napoleonic and Dutch royals. As early as 1926 the first rumours about a marriage for Princess Juliana of The Netherlands appeared in the press all over Europe. Polish newspapers said that Lord Rupert Cambridge, Viscount Trematon, son of Princess Alice, Countess of Athlone, would be the lucky man. Princess Alice was the daughter of Prince Leopold (Queen Victoria's haemophiliac youngest son) and Princess Helen of Waldeck-Pyrmont, a sister of Queen Emma, and thus was a first cousin to Queen Wilhelmina, so Juliana and Rupert were second cousins. Sadly, Rupert, a haemophiliac like his grandfather, died in 1930 after being injured in a car crash. Swedish newspapers then placed their bets on the German Prince Ernst of Erbach-Schönberg, son of another of Queen Emma's sisters, Elisabeth. The Minister of Foreign Affairs, Jhr. Beelaerts van Blokland, wanted to suppress the rumours. He invited the foreign correspondents in The Netherlands to his office and told them there was no truth to the story; the rumours duly stopped. Juliana herself was studying in Leiden and living with a group of friends in Katwijk; she was enjoying her freedom and was not thinking about marriage. Her mother and grandmother, however, did start to think about it. The same Minister of Foreign Affairs, Jhr. Frans Beelaerts van Blokland (pictured on the right), was requested to start looking around. The Minister was an enthusiastic genealogist and turned the Almanach de Gotha inside out. He would become the spider in the web during this search. All Dutch envoys would report to him about a Prince X or Prince Y; every diplomat had his own favourite and tried to promote him with Beelaerts. Even when Beelaerts resigned from his ministerial post and became vice-president of the Council of State, Wilhelmina requested that he continue his search. She did not want to get the new Minister involved as she considered this a private affair, and she once even said that Juliana's marriage should be a love match. Still, there were certain conditions that would be applicable even for a love match. First of all, the candidate had to be a Protestant. Wilhelmina was very strict about this; her dynasty had always been a Protestant one, and she thought it "out of the question" for Juliana to marry a Catholic. Her strictness even went so far that she did not allow Prince Charles of Belgium to be around when she and Juliana paid a state visit to Belgium. Rumours about a Catholic marriage had to be avoided. The second condition was that the prospective husband had to be a member of one of the royal families of Europe. Initially Wilhelmina would not consider princes of the mediatized houses but only those from the 50 royal families that ruled Europe after the Napoleonic wars. This was a standard that the Erbachs did not meet. It also ruled out members of the Dutch aristocracy as that would be an unequal marriage. The future son-in-law of Wilhelmina should also be in good health, and his family must have consistently exhibited impeccable behaviour. Many candidates realated to the British royal family were thus excluded due to fear of hemophilia. Juliana's family were more relaxed about the financial situation of her future husband; he didn't have to be rich, although it would be preferred because it would take away the impression that he had married Juliana for financial advantages. The prince would get a salary of 200,000 guilders, and he would be allowed to make himself useful in the Army. Although Juliana was still shy and clumsy, her university years had made her less insecure and more appreciative of qualities other than high birth and good looks: she made it known that she preferred her prospective husband to be an intelligent man. A German candidate was not the first choice, especially after Hitler came to power in 1933 and the Dutch population was becoming anti-German. Many German royal families were financially ruined or discredited in another way. So Wilhelmina had a preference for a Swedish Prince for a number of reasons. The Swedish Bernadottes were related to the Dutch Nassaus. Although the dynasty wasn't that impressively old, there were several young, good-looking princes. Beelaerts sent his first instructions to the Dutch envoy in Stockholm, Baron Dolf Sweerts de Landas Wyborgh, in April 1929: The Princess would be 21 by the end of the month, and the time had come to start looking for a suitable husband. Would the envoy be able to make some discreet enquiries at the Swedish court? Maybe the Princes could visit The Hague when they were travelling to Brussels, where the Swedish Princess Astrid was Crown Princess. And where did the princes spend their winter holidays? Switzerland would be a perfect place for a discreet meeting. Queen Wilhelmina refused to go to Sweden herself; she did not like the Swedish public, "too intrusive." The answers weren't encouraging. The princes would travel to Brussels via London, where they had relatives too, and the winter holidays were spent in Sweden. Initially Sweerts made enquiries about four princes. Prince Lennart was quickly skipped over as he seemed to be in bad health and suffered from bronchitis. So three princes were left: Sigvard and Bertil, sons of the Crown Prince, and Prince Carl (pictured on the right), a nephew of the King and the brother of the Crown Princesses of Norway and Belgium. Sigvard, however, seemed to have an unpleasant character and had artistic ambitions, so he could be deleted from the list too. Once Bertil was called a "real guy, navy officer who likes sport but who dislikes books." A disadvantage was that he had had a traffic accident 2 years previously where somebody died and the prince did not have a driver's licence. Wihelmina did not send Bertil an invitation to pay a visit when he was in The Netherlands for his Navy service. And Prince Carl was a charming boy, but unfortunately was only interested in cars. In England the Dutch Envoy, Jhr. Reneke de Marees van Swinderen, made enquiries about Prince George of Russia, son of Grand Duke Constantine. His employers were not exactly positive about the prince, so he didn't seem suitable to be the next Dutch Prince Consort either. The Countess of Athlone called her nephew Lord Frederick Cambridge (younger son of the Countess's brother-in-law, the Marquess of Cambridge, a brother of Queen Mary) "awfully shy and stupid" in a letter to Wilhelmina, immediately ruling him out as well. Wilhelmina, Juliana, and Hendrik went on several holidays - in the winter of 1930 to Oberstdorf, in the summer to Norway, and a year later to East Tyrol - but no Prince dropped by to get acquainted with Juliana. There weren't many options left, so they had to reconsider a German candidate. 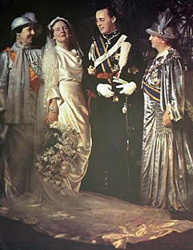 Queen Emma did not object to this as much as Wilhelmina did, and she asked Beelaerts in 1931 if he could see whether the Stolberg family had a suitable candidate. At least their name wouldn't be too harmful (the mother of William the Taciturn, the 16th century stadtholder known as the father of the fatherland, was a Stolberg). Otherwise perhaps the Houses of Hesse or Saxe-Altenburg might have a candidate? He shouldn't bother with the Anhalts or the Badens, who were outcasts because they had been involved with the Social Democrats in 1918. In Germany the Dutch envoy in Berlin, Count Johan van Limburg-Stirum became the central figure in the search. He did not have good news - most candidates sympathized with the Nazis or had other faults. When the Stolberg family was sorted out, they stumbled on three candidates. The first one was Otto of Stolberg-Jannowitz, but as he was born in 1893 he was considered too old. The other one was Prince Wolff Heinrich of Stolberg-Stolberg. He received an invitation to join the hunt with a cousin in Bentheim where Juliana was also present, but the Prince never showed up. A year later the reason became clear; he had married a commoner whom he had carefully "hidden" from his family. The third candidate was Prince Christian-Ludwig of Stolberg-Wernigrode, a nephew of "Aunt Lil," Princess Elisabeth of Erbach-Schönburg. He met Juliana in 1932 in Bentheim. Although he seemed somewhat childish, they did have a good time while having picnics and driving around the countryside. But when he entered the German Army a year later, he was erased from Beelaerts' list too. But the search continued. Count van Limburg-Stirum found three Princes of Sayn-Wittgenstein-Berleburg. Two of them got married shortly after they were "discovered," while the third one was a disappointment. The same was true of Princes Ludwig and Richard of Hesse. They were also unfortunate enough that Prince Hendrik was involved in their "selection," even asking the ex-Kaiser to mediate. This all annoyed Queen Wilhelmina, and no meeting was arranged. There was some confusion about two Princes of Schönburg. Did they belong to the Catholic or the Protestant branch of the family? Prince Hendrik also mentioned one of them to Beelaerts, who cynically remarked, "one is a candidate of our high gentleman [the womanizing Prince Hendrik, Juliana's father], so he should be a philanderer." In 1934 Carl August of Saxe-Weimar was mentioned, but he served in the Reichswehr and so was discounted. In 1934 Wilhelmina revealed her worries to her cousin Alice of Athlone: "I am so anxious she should have a large choice. Court life here is reduced to the official and practically we have the whole year a quite private life." Consequently Alice sent an invitation to Juliana to spend the summer in England, but after only a few days she had to return to The Netherlands as her father had died. Due to this lack of success, Beelaerts wondered if the Swedish princes might have changed for the better by now. Sigvard was married, and Envoy Sweerts wasn't too positive about Bertil: "he is mostly interested in airplanes and cars." Prince Carl, however, had improved: "he has nice manners, is elegant, easy going and his intellect isn't below the average." The envoy did warn, however, that Carl "isn't made of wood and he is said to have success with a lot of girls in the highest circles." The King of Sweden announced to his own envoy in The Hague that he would like to cooperate in a meeting between his nephew and Juliana. 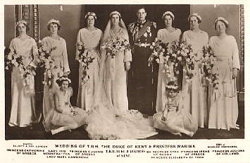 The first opportunity for Carl and Juliana to meet would be at the wedding of the Duke of Kent to Princess Marina of Greece in London in November 1934. Juliana was asked to be a bridesmaid by Marina, and Cousin Alice of Athlone asked her sister-in-law, Queen Mary, to send an invitation to Carl. Carl duly travelled to London, where he was teased by the younger princesses as rumours about an engagement started to appear in The Netherlands. Some shops even placed pictures of the Prince in their windows, and books about him were for sale. Wilhelmina was furious, of course; however, Juliana found the rumours amusing. The meeting was an absolute disaster. The Dutch envoy in London, Jhr. Reneke de Marees van Swinderen, blamed Juliana. She seemed uninterested; as a young intellectual woman she might be admired by older men like King George V, but "young people require a bit more than just intellect"; they were interested in a woman's appearance rather than her intellect. Juliana didn't do anything about her appearance, and she was habitually unpunctual. Carl made an excellent impression on de Marees: "no wonder that all the girls were calling him all day for dates to parties and other festivities." de Marees also thought there may be a Danish-Norwegian-Greek plot at the British court to prevent a Swede from getting so close to the Dutch throne; Queen Maud of Norway, sister of George V, was the prime suspect. Juliana showed her preference for the Greek Prince Paul, whose dynasty was Danish. Maybe this caused a revival of Danish-Swedish rivalry? After Juliana left, the envoy fell ill from all the stress and had to stay in bed for a week. The Swedish envoy in London and Princess Alice wanted to mediate between Juliana and Carl, and even Wilhelmina did not give up all hope. She refused, however, to get Queen Astrid of Belgium (sister of Carl) involved because she suspected that King Leopold III wanted his brother Charles to marry Juliana and had discouraged his brother-in-law Carl. The suspicions were totally unjust, but it shows the frustration that was felt. Juliana, in the meantime, did not regret it too much because she thought Carl was immature. Candidates who had been rejected previously were now given a second look. They started with Prince Christian of Schaumburg-Lippe; at least he was half Danish. In 1930 the Dutch envoy had already pointed him out to Beelaerts, as had his unmarried aunt Princess Thyra of Denmark. Apparently Juliana and Christian had already met in 1932 in Mecklenburg and danced a tango together, rather enthusiastically. The downside: he had been engaged three times, and he had the reputation of being a womanizer. Queen Emma met him once too and considered him "very German"; he said he wanted to change everything in The Netherlands. Christian remained an outsider, but when there weren't many candidates left, he was reconsidered. During the winter of 1935, two princes cancelled their appointment with the Princess and Queen at their winter resort. Wilhelmina even wanted to organize a ball at the palace of her brother-in-law, Duke Adolf of Mecklenburg, but on second thoughts she decided that it was not a good idea since Germany was once again implementing conscription. A fiancé in a German uniform was not exactly a welcome prospect. Beelaerts, however, disagreed with the Queen. He pointed out that we cannot look into people's hearts and that many of them were appalled by the present regime but could not say anything about it. Greece, maybe? A son-in-law from the Balkans was not exactly what Wilhelmina wanted either, but the Greeks were in fact a Danish dynasty. Beelaerts found two princes, Paul and Peter, both good looking and with a good reputation. Paul, however, was reserved by his brother for the Greek throne and actually returned to Greece in 1935. Wilhelmina now concentrated on Peter, who was called "Black Pete" by the diplomats as he had dark eyes and dark hair. Peter seemed an excellent man, but he was a Greek Catholic and his maternal grandfather was a Bonaparte who owned a casino in Monte Carlo. Much to the regret of the diplomats, that background would not be acceptable to the Dutch public. The diplomats started to become slightly desperate and lowered their initial conditions even further. Wilhelmina wanted them to make enquiries about the Princes of Lieven. Beelaerts found six of them who were of the right age and unmarried, but in the end they were considered "too light" as their family did not have a glorious past or impressive connections. In autumn 1935 it was the turn of envoy Baron Marees in London to show his despair: in the absence of any likely alternatives, he finally suggested Prince Charles of Belgium on the basis of "rather a Catholic than no marriage at all." In Berlin, Count van Limburg-Stirum (pictured on the left) wrote "beggars are no choosers" and thought that they needed to be less selective. It seemed that they had no other alternative than a German. The envoy turned the Almanach de Gotha inside out again, and as well as Christian of Schaumburg-Lippe he found Prince Heinrich I of Reuss and recommended that Juliana should meet him, even though his brother-in-law was serving in the Nazi SA. Since Juliana was almost 27 it was felt that time was running out, and this was why Queen Wilhelmina decided to go to the Olympics in Garmisch-Partenkirchen, where Juliana and Heinrich could meet. To avoid a meeting with the Nazi leaders they stayed in Austria, close to the border, at Igls. 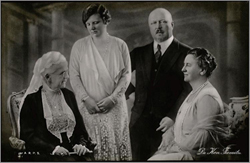 And it was here at Igls that Prince Bernhard of Lippe-Biesterfeld asked to be introduced to Juliana and her mother. As a pretext, he said that their fathers had known each other. He came out of the blue: in the seven years of correspondence between diplomats his name had never popped up, though some sources claim that he was approached by the Dutch ambassador in Paris. Perhaps they "missed" him because he only became a Prince five years after his birth, as his uncle did not approve of the marriage of Bernhard's father to a divorced baroness. The uncle later softened and elevated Bernhard and his brother Aschwin to Princes. Bernhard told his biographer that he thought Juliana was very sweet, intelligent, and much under the influence of her mother. Juliana liked his charm, manners, and intelligence. However, Wilhelmina and Juliana still had to meet some more German relatives and prospective husbands. Juliana finally met Prince Heinrich but did not seem too impressed by him. A meeting with Prince Carl August of Saxe Weimar failed because he did not get leave from the Army. At the end of February the Queen returned to The Netherlands and made enquiries about Bernhard and his family. Beelaerts did his best but came up with negative results: that branch of the family was not very healthy, and Bernhard had been in hospital for trouble with his lungs. Duke Adolf of Mecklenburg and his sister Grand Duchess Elisabeth of Oldenburg (siblings of the late Prince Hendrik) sent negative replies too: the prince was too loose, he lived in Paris where he enjoyed cocktails and girls, and his mother was a divorced lady who lived on her estate with a Russian colonel. "Nothing good can come from this" was their final advice. Wilhelmina, however, took these replies lightly. It seemed that Juliana had found the man she wanted, and Bernhard had also made a favourable impression on Wilhelmina. She suspected that much of this negative information was because of petty rivalry between German families. Juliana and Bernhard got engaged five months later, and they married on 7 January 1937. Wilhelmina thanked Beelaerts for all his efforts "despite all the silly talk of relatives" and nominated him to become a Minister of State - a fitting reward for his many years of service on behalf of the continuation of the dynasty. The marriage of Juliana and Bernhard would last for 66 years and, while being a love match at least on her side, would be tumultuous to say the least. Nevertheless, it would survive their five years apart during World War II, the crisis about faith healer Greet Hofmans, Bernhard's infidelities and two illegitimate daughters, and his involvement in the Lockheed scandal. Both of them died in 2004, only half a year apart. This article is based on the second part of the Wilhelmina biographies by Prof. C. Fasseur (Wilhelmina, Krijgshaftig in een vormeloze jas, Amersfoort 2001).